This is a slightly awkward routine which has become very familiar to me over the past few weeks canvassing in Durham. If I’m lucky, I might get a ‘aye, pet, you’ve got my vote’, so I thank them and tally it on the data sheet. If I’m not so lucky, I might get a sharp ‘no’, or maybe a door-slam and the odd expletive or two. But what I’ve found much more interesting than preaching to the converted Leavers, is engaging with voters supportive of Remain. I feel I’ve discovered three significant kinds of remain voters on my travels: EU-enthusiasts, reluctant Remainers and intimate EU beneficiaries. EU-enthusiasts are perhaps the rarest breed I have met, yet I find myself respectful of their unashamed – and often very articulate – conviction for the EU’s federal ambitions. Yet whilst I wish them well personally, I utterly refute their bizarre desire to homogenise a superficial civic society around imagined values and incongruous cultures in the form of monstrously unaccountable bureaucracy. I suspect these EU-enthusiasts are more aligned with the thinking of the European Commission than that of the ordinary British voter. The much more prevalent Remain voter appears to be those whom are somewhat dissatisfied with the EU’s federal ambitions, unaccountability, whopping membership fee and mismanagement of the Eurozone and refugee crises, yet reluctantly will vote to endorse the project out of fear for the apparent economic and geopolitical consequences so roundly peddled by the Government and Stronger In campaign. I find this quite understandable given the small ‘c’ conservative nature of the British electoral psyche and its trepidation for change. The trouble is, the European Commission will not recognise a truly reluctant Remain vote as a reluctant acceptance for the status quo; their eyes will detect a green light for the integrationist, federal agenda of the EU elites – a far cry from the reality of the unenthusiastic British voter. Yet this fear of risk is counterproductive. All radically positive constitutional change has come with an element of uncertainty: there was so-called ‘risk’ in ending the certainty English absolute monarchy in 1688; there was ‘risk’ in giving free-men the vote in 1918, and; there was ‘risk’ in fully extending female suffrage in 1928. A great irony is therefore presented: there is no such thing as a vote for the status quo. A win for either side in the referendum will not result in business as usual. If we vote to Remain, the EU train will continue rolling along the tracks of federal integration: hurling towards a common EU tax code, harmonisation of welfare systems and a European Army. Whereas if we vote to Leave, we can disembark this train and end the status quo of being a nation shackled to the only declining trade bloc in the world, with its ultimate sovereignty laying in Brussels and not Westminster. Milton Friedman’s ‘tyranny of the status quo’ accurately explains why it is the natural human condition for voters to pursue the apparent psychologically safest and most familiar path, but this really is not on the ballot paper. This brings me to the final kind of Remain voter – the intimate beneficiary of the EU. Friedman explains that where an apparent status quo exists, a body of interest groups will parasitically grow around the established agent, dependent on its survival. We witness this in the case of the EU; a state without a natural nation of people – no genuine society with feasible social capital. The EU may have a flag, anthem and common passport, but it lacks the essence of a nation. Instead, the EU is forced to create a cosmetic civil society reliant on its financial grants, funding and benevolent support. A body of intimate beneficiaries exists, bound to supporting the mother-institution upon which it feeds. Remain voters fitting this description whom I have met have been farm-owners, defendant of their Common Agricultural Policy subsidies; lecturers and university officials, protecting their EU science and research funding, and; NGO workers who rely on EU charity grants. But this is purely a case of ‘better the devil you know’ – we could have a British civil society where the government awards financial support, grants and funding to our own charities, universities and farmers, without having to navigate the bureaucracy of the EU in the name of an artificial civil society to ensure the EUs self-interested survival. There would be no need for this referendum if a European status quo truly existed; the previous vote in 1975 would have settled the question once and for all. The very fact there has been such political demand for the vote this week is testament to the to the enlarging nature of the untameable bureaucratic beast that is the EU. 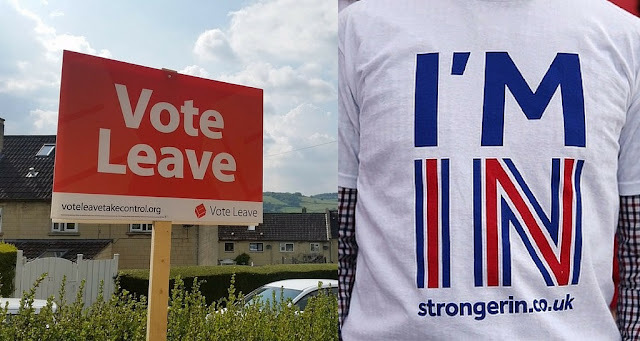 Neither side can plausibly predict the future with absolute certainty, but at least a vote to Leave will make us the masters of our own destiny.